Patent leather boot 18 inches tall with a 4.5 inch heel. Because of the narrow cut ankle, we recommend 1/2 to a full size larger than your normal shoe size. Non-returnable. 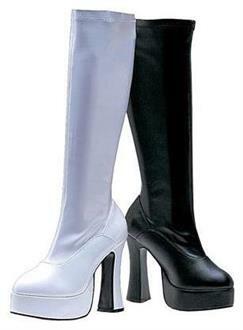 =1- Size 10.Patent leather boot 18 inches tall with a 4.5 inch heel. Because of the narrow cut ankle, we recommend 1/2 to a full size larger than your normal shoe size. Non-returnable. Size 11.Patent leather boot 18 inches tall with a 4.5 inch heel. Because of the narrow cut ankle, we recommend 1/2 to a full size larger than your normal shoe size. Non-returnable. Size 12.Patent leather boot 18 inches tall with a 4.5 inch heel. Because of the narrow cut ankle, we recommend 1/2 to a full size larger than your normal shoe size. Non-returnable. Size 7.Patent leather boot 18 inches tall with a 4.5 inch heel. Because of the narrow cut ankle, we recommend 1/2 to a full size larger than your normal shoe size. Non-returnable. Size 8.Patent leather boot 18 inches tall with a 4.5 inch heel. Because of the narrow cut ankle, we recommend 1/2 to a full size larger than your normal shoe size. Non-returnable. Size 9.